But I am happy to report all’s well that ends well. As you can see I pulled it off. Not to say that MANY "heart attack moments” didn't pop up along the way. My first issue, the fondant was sticking to my counter in the worst way. So I added powdered sugar BUT if I continued to add powdered sugar so that it wouldn't stick, it would quickly dry it out (okay and I'm sure the location of the central air vent in our kitchen blowing right on it didn't help matters), but I discovered you MUST make sure you surface is clean and I when I say clean I mean clean, clean. I think I was just wiping the surface thinking it was clean BUT you could feel powdered sugar residue left over from the previous rolling. Plus I needed to roll out a larger piece than I had ever previously done due to the fact that it was a tiered cake. After numerous attempts both cakes were covered. I'm not sure if it's just me but that is the worst part in my opinion. After the cakes are covered I totally love the decorating part of it. The next stressor was the adding of the dowel rods to give support when you stack the cake. It becomes so heavy with fondant that you don't want to have the bottom layer collapse when you place the top tier onto the bottom cake. First, you need to cut the dowels just right, about 1/16th lower than the cake is what I did, and you need to place them just slightly inside the perimeter of where the top cake will be placed. MAN, someone should warn you how stressful cake decorating can be; it was like me being a new surgeon operating for the first time. Will was my "assistant" handing me the dowel rods and cheering me on. Just watching yourself insert the rods into the bottom cake (and therefore destroying the flawless finish you just spent forever creating) and hoping you measured correctly is nerve wracking to the fullest extent. Next came placing the top tier onto the bottom, (or in layman’s terms - waiting for the bottom cake to collapse when you let go.....) My "assistant" had the important job of watching to see if any bulging occurred, and the first sign of it I wanted him to say "problem" and I would quickly remove the top as to save at least one half of the cake from total destruction. But guess what? It didn't happen!!! Next came Will wiping sweat from my brow, and me placing the center dowel rod down through the entire thing. If I made it through this I was going to celebrate with a nice margarita or two or three. Much to my surprise it went much smoother than my nerves would ever allow me to believe it could be. I had to just step back at that point and say "I did it”!!! I was so excited I think I cried happy tears. :) Sure there are a few minor flaws I have to work out and things I really would have been "better" with the cake but overall I guess for the stepping into to virgin cake baking territory (I’ve never taken a cake decorating class in my life) I didn't do too bad, did I? * Other than the counter having some residue, is there anything else that could be making it stick? I am using the Marshmallow fondant recipe as seen here. * I noticed that I got a few air bubbles even after I smoothed it out, any tips on how NOT to have that happen? * What do you do it you accidentally mark the fondant after it is on the cake - like a finger nail scrap as you put the decorations on to the cake. Is there a way to smooth it out? * How long do you wait until you put ribbon on the bottom of the cake if you are indeed doing that so that it doesn't appear that it is bulging over the ribbon (and I also think I put it on too tight). In the end, I did what I set out to do; I baked it, assembled it and transported it all in one piece, AND still lived to write this post. I guess it's true what they say, what doesn't kill you will make you stronger. I promise I’ll be back shortly with an actual recipe. Thanks to all who got this far in the post for my “therapy session”. You can all send me your bill in the mail. Attempt?? I say you NAILED it! You are a pro already. I do have a tip on air bubbles. Take a needle and poke it in the air bubble at an angle, and then smooth the air out. Works like a charm! Thanks Leslie! I saw your gorgeous cake so a compliment like that from you means so much to me! Yep, I did that for the air bubbles too, except I used a tooth pick, which probably leaves a bigger mark so I'll do the pin next time. Thanks for the advice! Why do they happen in the first place? Is it something I'm doing wrong or is this normal for it to happen? So glad you stopped by! Thanks again for nice compliment! Wow this is amazing! I would say you more than accomplished! I have been wanting to take the classes for a while but havent gotten around to it. I think it looks fabulous! This is awesome...you are my hero! 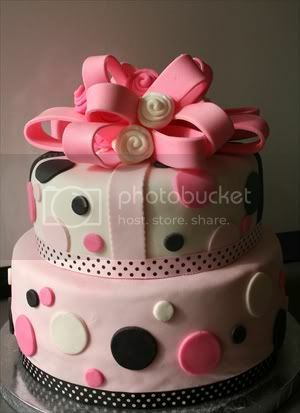 I am obsessed with fondant cakes, but have only tried a few and never have done tiered. You made it sound scary and doable all in the same breath!! Thanks! It's so beautiful! well done. I've only played with fondant once and that was enough for me. I didn't like the taste at all but I love what you can make with it. You did such an amazing job!! Your cake came out great! Being a fondant lover but not really a doer. I know what you mean. But now that I have seen what you have done. I think I can go ahead and take another crack at it! Fondant cakes bring me to tears as well. And that's just looking at them! Yours is so very lovely. You did an awesome job. Fondant definitely takes some getting used to - but practice definitely does make things easier. As far as the sticking goes - well, it sticks by nature (like cookie dough without enough flour on your rolling surface, etc). I have a large silicone that I roll fondant out on which helps. Just make sure you have a super clean surface, and dust the surface with cornstarch or powdered sugar. I also HIGHLY recommend buying some rolling pin guides, that help you to get the fondant rolled out evenly. I've found that a thicker piece of fondant works better for me - the fondant is a lot smoother (less lumpy areas, which annoy me like crazy! - my eyes constantly go to imperfections on my cakes). You guys are going to make me cry!!! Thanks so much for the kind words! I'm glad I can inspire you to jump right back in to the kitchen and give it a try! It is nerve wracking at first but then I kind of warm up to it and start to like it. In fact, I just said to Will I bet when I go back to making cakes with just butter cream they will look so different now - less perfect maybe? Thank you so much for your comment. I visted your blog and WOW you are good!!! Thanks for the tips and you are right, now that I think of it the top cake shows less imperfections due to the fact that it was thicker! (smacks hand on head - now why didn't I think of that???) That is exactly what I am doing, everytime I see the cake I go right to the spots I HATE!!! Your advice is GREATLY appreciated! Thanks again! 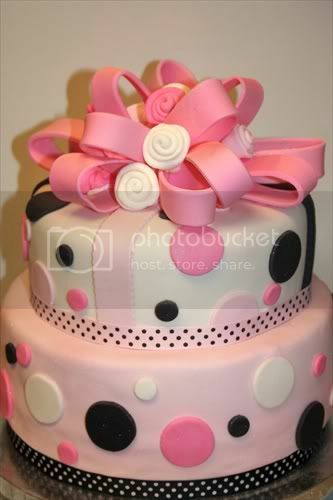 The cake turned out awesome, its great that you got to practice yet again, good job! Kudos...you should be beyond proud of yourself! You did a stellar job and only your second time!? WOW! Your cake looks fantastic! Stacy this cake is absolutely stunning! Hi...i almost gave up after my first fondant attempt too, but after lots of trial and error...and finding a great recipe, I think I've got it down. Lol. I have one tip on the recipe you're using, its the one I used at first and had tons of issues with it being either too sticky or too dry, and also had issues with it tearing and cracking once it was placed on the cake. This will save you so many head aches...as two tablespoons of light corn syrup to your fondant recipe. Add it in before you add the powdered sugar. It makes your fondant more pliable and so much easier to work with. And to address your problem with it sticking to your counter when rolling it out, after every roll, turn it or dust the top with powdered sugar and flip...keep doing this until its rolled out to the desired size. Sticking will happen if you don't do this, no matter what, unless you gave a fondant mat or marble counter tops. Btw, I think your cake came out beautiful.